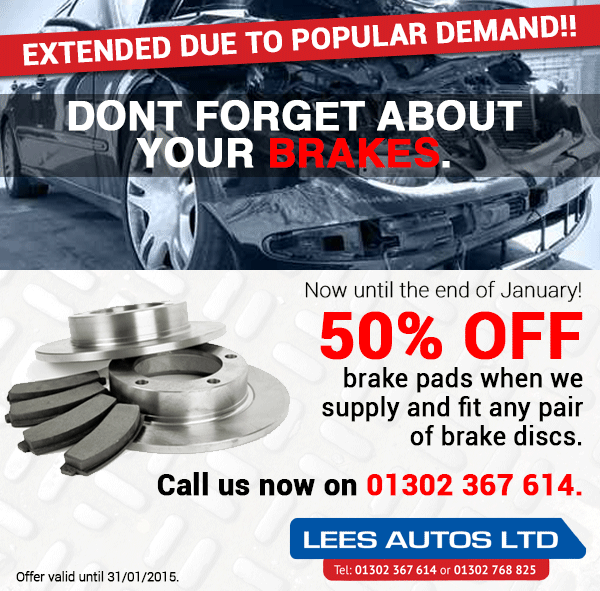 Brake Pads are HALF PRICE when we supply and fit any Brake Discs at Lee’s Autos Ltd – Extended until January 31st due to popular demand! If your brakes are starting to wear out or squeal, come down to Lee’s Autos Ltd. If we supply and fit new Brake Discs, we’ll supply and fit brand new Brake Pads for half our usual price. This offer expires on the 31st January 2015 so if your brakes aren’t working as good as they once were, make sure you bring us your car this month so you don’t miss out on this limited time offer. Don’t compromise with you and your families safety, if you think you may need your brakes looking at give us a call today on 01302 367 614. ← 50% Off Brake Pads This Month!